Since the announcement of Microsoft HoloLens handsets, the company never opened up about the number of units that have been sold, nor the complete availability of it. However, that changes today as Microsoft at the Future Decoded event in London has confirmed that HoloLens is expanding to 29 more markets. HoloLens is Microsoft’s mixed reality take on Apple and Google’s AR efforts. As of last March, Microsoft claimed that 150 apps are built for the HoloLens and it is even heard that the company is working on the second-generation HoloLens hardware device which will feature its own AI chip. This dedicated AI chip inclusion will move some of the HoloLens computing from cloud to local. Currently, Microsoft sells Development Edition of the HoloLens for $3,000 and a ‘Commercial Suite’ with added enterprise features for $5,000. Microsoft even mentioned that it would roll the most asked features via software updates for HoloLens to our existing customers sometime early next year. It also said that in the first quarter of next year the company would be shipping an additional holographic remote instruction capability built on Microsoft Teams and Azure Active Directory. 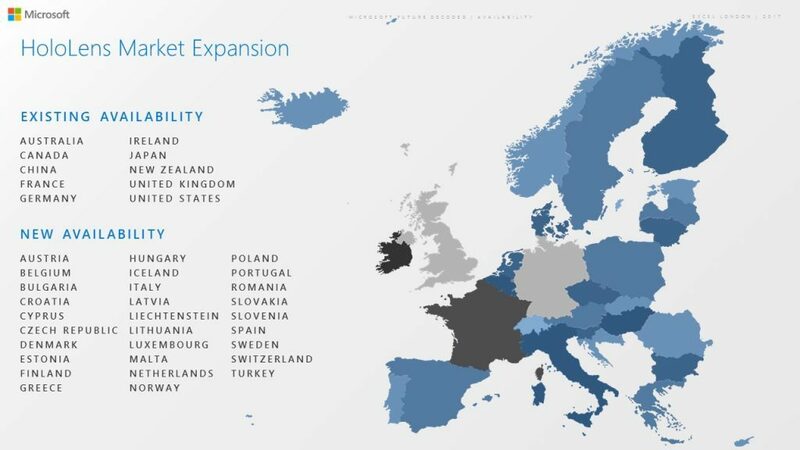 The new markets where the HoloLens will be available include Austria, Belgium, Bulgaria, Croatia, Cyprus, Czech Republic, Denmark, Estonia, Finland, Greece, Hungary, Iceland, Italy, Latvia, Liechtenstein, Lithuania, Luxembourg, Malta, Netherlands, Norway, Poland, Portugal, Romania, Slovakia, Slovenia, Spain, Sweden, Switzerland and Turkey. HoloLens has passed basic impact tests for protective eyewear standards in North America and Europe and is also IP50 rated for dust resistance. Microsoft announced that the HoloLens hard hat accessory is in production and will be available for purchase early next year.